Show Racism the Red Card - Dani Alves receives racism in Spain. Dani Alves receives racism in Spain. 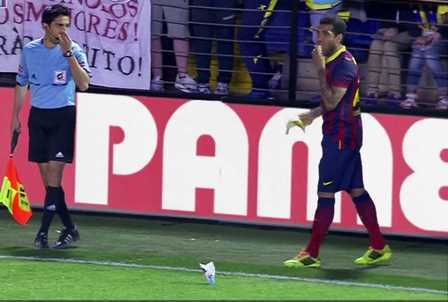 Dani Alves has banana thrown at him during the Villarreal v Barcelona match in Spain. "We have suffered this in Spain for some time," said Alves. "You have to take it with a dose of humour." Referring specifically to Sunday's incident, he said: "If you don't give it importance, they don't achieve their objective." Show Racism the RED Card urges the Spanish FA and UEFA to fully investigate and take a strong stance on racism in Europe. More needs to be done to ensure that these incidents do not occur and more action must be taken.